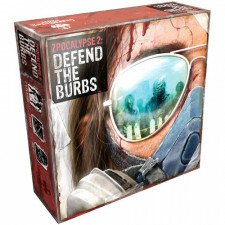 Zpocalypse 2: Defend the Burbs is NOT the zombie sequel to the little known ’89 Tom Hanks flick centered on a suburban neighborhood. 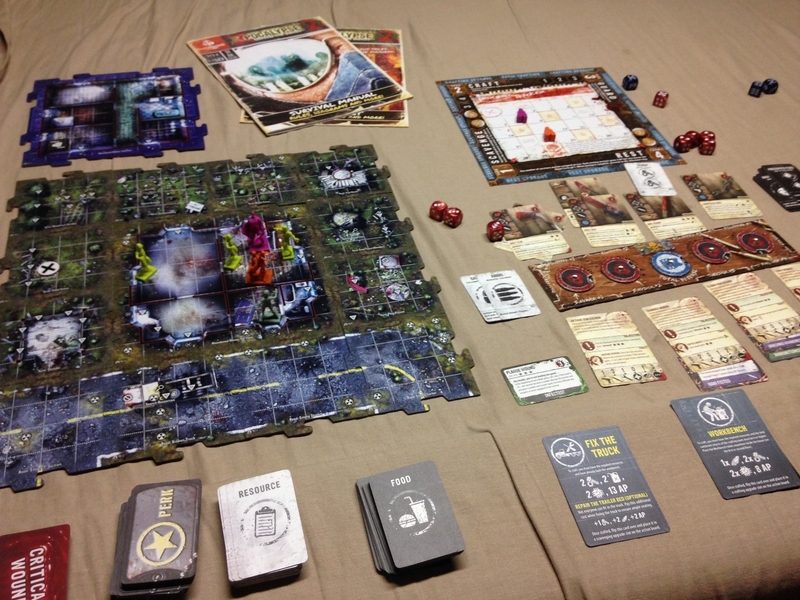 This IS the sequel to the opaque and not quite realized survival horror board game Zpocalypse. The previous iteration was a zombie thriller that took a different path. Whereas its competition focused on straightforward brain busting, the Z-poc was all about scavenging and building up your home. It was a solid design that didn’t quite make it big, marred by a faulty rulebook and some growing pains from at the time newcomer Greenbrier games. Now it’s back for another crack at the nail-spiked bat. Zpocalypse 2 is very much a re-imagining. It refines basic concepts and builds upon what its predecessor accomplished. The identity is the same as players spend multiple “days” of in-game time building up their home and alternating between scrounging after supplies and beating back the unrelenting waves of undead soliciting door to door. It’s more of the thinking man’s zombie holocaust, but we’re still talking rotting meatbags walking the streets so its level of sophistication is more along the lines of putting Grey Poupon on a hotdog. This dog is jumbo sized and quite the table hog. The structure is the Z-poc special sauce. This is a campaign game played over 1-4 sessions following narrative beats in the story book. Each chapter of the gives you a medium term goal such as repairing a truck and relocating your safe house to a zip code that doesn’t smell like a slaughterhouse. These objectives will take multiple rounds of the day/night cycle of play as you explore, kill, and hoard your way to victory. It’s a very clever way of providing a semi-rigid story arc while allowing you to forge your own narrative beats through open play within each chapter. The day/night cycle is pretty slick. During those hours where the sun is peeking above the tree line you go to work. 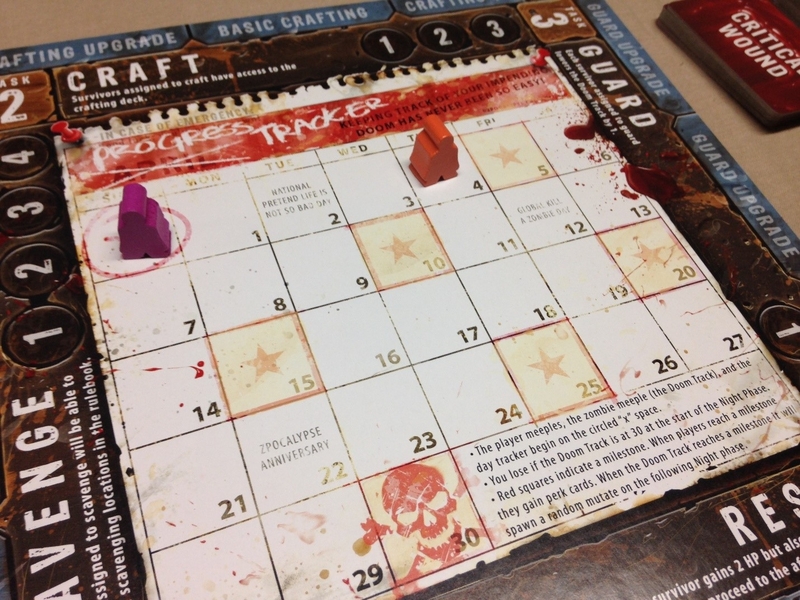 Players alternate assigning survivors from their group to different tasks in a loose worker placement system. You can go on a supply run, craft different odds and ends, perform guard duty, or even take a load off Annie and rest. 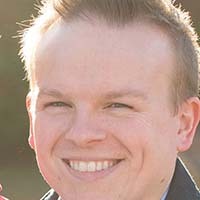 Scavenging has players rolling on random encounter charts for different areas of the ‘burbs. These colorful entries bring the environment to life and inject a stronger sense of presence into the game. You never quite know what you’re going to run into and the dice based skill tests involved can be rough. Hopefully you come back with some beans and mechanical parts so Ben can build a stove. If you’re particularly unlucky you may also come back missing a finger or swollen with radiation. YOLO was never more prophetic. Crafting is what you need to do to accomplish many of the chapter objectives. You can also jerry-rig other gear to help you survive the night, even tossing up makeshift defenses which modify your homestead and affect the tactical miniature portion of the design. The feedback loop of gathering supplies and reinvesting them into your leaky shanty to thwart the moaning bastards is juicy and satisfying. Is this sucker Gregorian or Babylonian-derived? Guard duty is necessary as a method to hold back the doom. Doom is measured on a nifty sideboard as a quantitative measure of the horde’s size and ferocity. It dictates how many zeds show up at night time to piss in your lawn and also signifies a total loss if it reaches the end of the track. That slick-looking calendar doubles as a track to measure player character experience as their party members gain new perks and abilities through felling soulless loiterers. The day phase has a definite tension in that you really want to accomplish a great deal, but the work day is short and your laborers have collective bargaining mandated breaks at regular intervals. Besides, they need to get home quick to fend off the plastic mob. 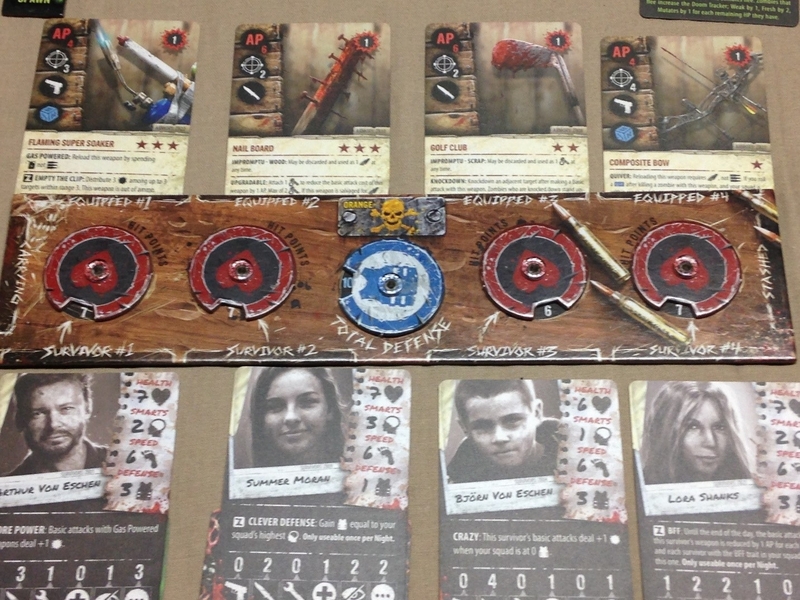 A player board with a tooled-up group. The night phase is the more recognizable and traditional aspect of Zpocalypse 2. Players deploy their miniatures to their safe house and engage in a quick tower defense skirmish of five rounds. 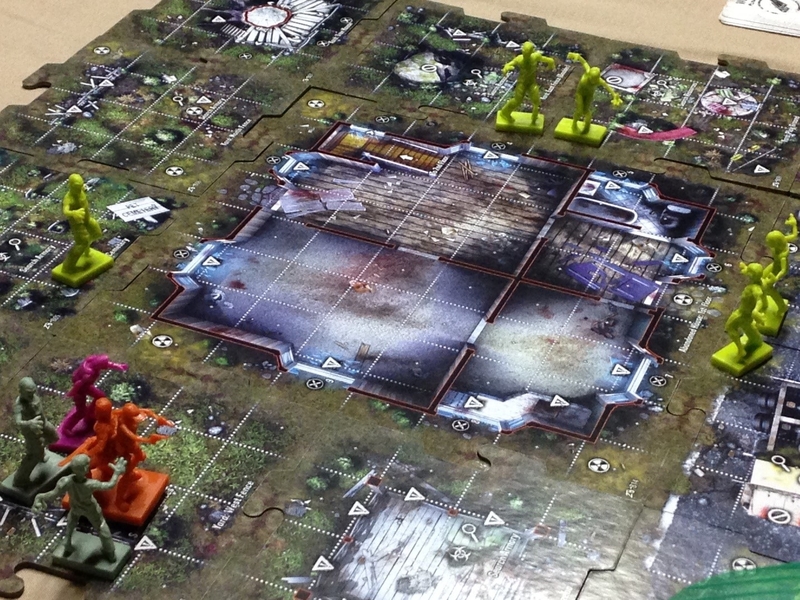 This is an action point based system where each player moves around a miniature representing a group of 1-4 survivors. You spend dice from a rolled pool to perform attacks, sprint about the map, and perhaps search. Unlike the OG Z-poc, attacks here are deterministic as you spend enough action points and you automatically inflict damage. The skirmish night phase certainly has its moments but it can be a bit bland. The map remains mostly the same as the story goes on and the repetition can be a drag. There is some variety in how you shape your base through crafting, as well as random mutation zombies that pop up functioning as mini-bosses. The overall experience is a bit puzzle-y though and after a couple of days in the campaign you can feel yourself getting impatient at times as you just want to get back to the more interesting daylight procedure. Fortunately, the five round timer does keep things moving and combat manages to rarely overstay its welcome. The minis aren’t particularly stellar, but with a modest price tag that’s to be expected. Zpocalypse 2 is an all-around smoother and more accomplished work than its progenitor. The rules are much cleaner, the options more straightforward and intuitive, and the whole experience possesses a flow that simply wasn’t there prior. It does still attempt to straddle the line between fully and semi coop with some competitive elements, but it’s easy enough to ignore these if that’s not your bag. Quirks aside, this manages to remain a unique entry into the genre that carves out a niche and provides an excellent experience based around survival. I’d take this Grey Poupon lathered beef product over that runny mustard filler any day of the week.